This week I would like to welcome Ronne Rock to the blog. Ronne and I had an open honest conversation on By His Grace this week about church hurt, and loving the body of Christ. Ronne is a woman passionate about loving and serving her creator on the mission field of life. Today she shares why we need to go through the fire. Please welcome Ronne Rock to the blog. Looking back on all the prayer requests and emails and comments I’ve received when I’ve asked, “how may I pray for you right now – what’s going on in your life?” the subject that eclipses all others is pain and suffering. There are volumes of good theological discourse on why pain exists in the first place, and wonderful studies done on pain’s purpose in our bodies. What’s been churning around in my heart lately is neither. It’s been 19 years since my mom took her last breath on this earth. And this year, there will be both the ache of her absence and the rise of fresh bravery to live my days fully in her honor. I don’t have answers to every “why” of pain, but one of the most powerful things I’ve learned about its usefulness is the power of scorched earth. 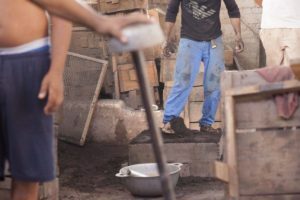 Each time I visit LaPaz, Honduras, to spend time with the children of Niños Comúnidad, I ask if we can stop by the foundry where aluminum pots and kitchen utensils are made. We first visited one several years ago, when a local friend asked if we’d like to see a small miracle in the making. Our van wound through narrow streets for a bit, and we then parked next to a rusted corrugated metal wall. The smell of petroleum and earth was thick in the air, and waves of heat flushed our faces as we entered the yard. On the other side of the wall, men were working – all in tattered clothes and flip flops. A fire blazed in one corner of the yard to transform recycled metal into brilliant red liquid, and under a thatched roof that offered a bit of shade, the molten metal was being poured through small holes in hand-crafted molds. Bowls, plates, and large cooking pots were being made that day. The red-hot aluminum reaches 1000 degrees before it’s poured. The laborers’ feet and hands are marked with scars – something they say is a harsh reminder of the road marked with purpose. That first foundry in the community was started by a man who learned the art of casting pots from his grandfather. While there are factories in other parts of the world that make the same type of thing, he wanted to retain the heritage and dignity of the craft. So, he set up shop in a struggling neighborhood and made jobs available for men who desperately needed a way to earn a living. Each item produced means a bit of money in empty pockets, and even more money can be made if the men are willing to travel. It’s difficult work, but the sense of pride in craftsmanship is evident in everyone’s faces. The work of their hands feeds their families and pays for electricity and helps start new businesses so more people can work. Last October, friends and I visited a new foundry, located behind a small home and storefront in the same neighborhood. A growing business meant new opportunity for more men who had been trained to cast, and this new location allowed each of us to get even closer to the detailed work being done. Metal had just been poured and large aluminum pots were cooling to the side. Two of the men looked at each other, smiled, and began a friendly competition to prepare the next casts. 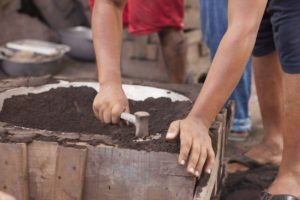 There was a rhythm in their well-honed labor, as they shoveled dirt into the wooden frames, packed it with their feet, trimmed it with knives, and carefully examined their work. Over and over, the process continued. Two frames would be carefully packed, and then the bowl or plate or pot would be added and packed into place with hammers, then even more carefully removed to reveal the shape to come. We were captivated by the process, mesmerized by the joy of the workers as they had the rare chance to show off their skills. There was no vocational school or university to teach them; no, everything they had learned had come from the classroom of experience and fire and earth. 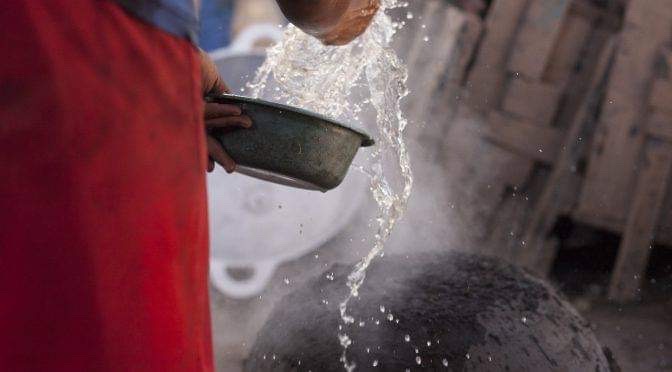 You see, the dirt used by the foundry laborers to create tools used to prepare meals that feed bellies and bring life has to undergo its own transformation before it can transform molten metal. It has to go through fire. 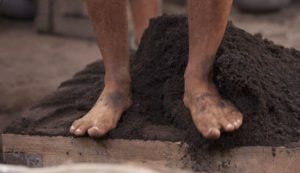 The workers walk to a nearby dry riverbed and bring the soil of clay and sand. It is sifted first to remove rocks and debris, and then it is set ablaze. The fire changes the chemical composition of the soil, making it stronger, more resilient, and more malleable. Only then can it hold its shape and cradle its creation. The fire gives the soil greater purpose. It gives the soil life. In Guatemala, the volcano Fuego spews smoke and ash daily, and its lava streams threaten those who live below. It is hell-bent on destruction – and yet, life emerges. Its sister volcano, Acatenango, bears the brunt of Fuego’s fury and yet is home to some of the most robust coffee plantations in the country. Fuego’s fire is fuel for Acatenango’s strength. Gold must melt to remove its impurities so that it becomes worthy to wear as a covenant symbol. Minerals moved through fire become glass and pottery that only then is used to pour out and serve. And you and I, moved through fire, become too. What we become depends on our response to that fire. Again, I don’t have answers to every “why” of pain, but I do pray we are unafraid to become scorched earth through its presence in our lives, and let pain become a road marked with purpose. I pray that with the ache comes the bravery. Ronne Rock believes that you are hand-crafted by God for a life that is rich and vibrant and filled with stories. 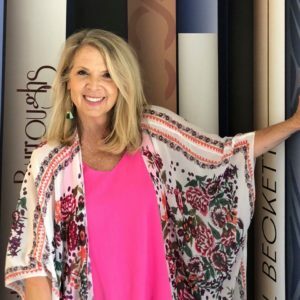 She travels the world to find hope and restoration in the midst of brokenness, and she invests in the lives of women to provide encouragement and wisdom for faith’s journeys. Connect with her on Facebook, Instagram, or on her website at RonneRock.com. Tell stories that change stories. Hey friends, Got lots of exciting things going on behind the scenes. Be sure to sign up to receive the latest updates.